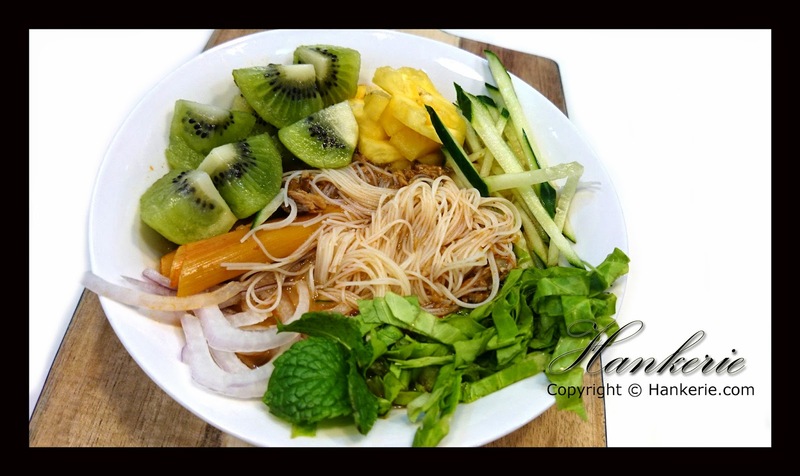 Day 5 of my NZ Zespri kiwi challenge, today's topic is serving the kiwifruit in hot dish. In my first thought, what green kiwifruit can substitute any ingredients in any of the hot food. The first thing that sprang into my mind was Penang Asam Laksa, the unique sourness of green kiwi can substitute a bit of tamarind pulp. Chef tips "When using kiwifruit in hot dishes, add it at the very last minute, so that it will retain its bright color. This improvise Penang Asam laksa version is our family's favourite as they are not only easy to cook or prepare, but also much healthier version in our view. The main reason being that we omit the prawn paste aka "Hei Ko" which is not our family's liking. 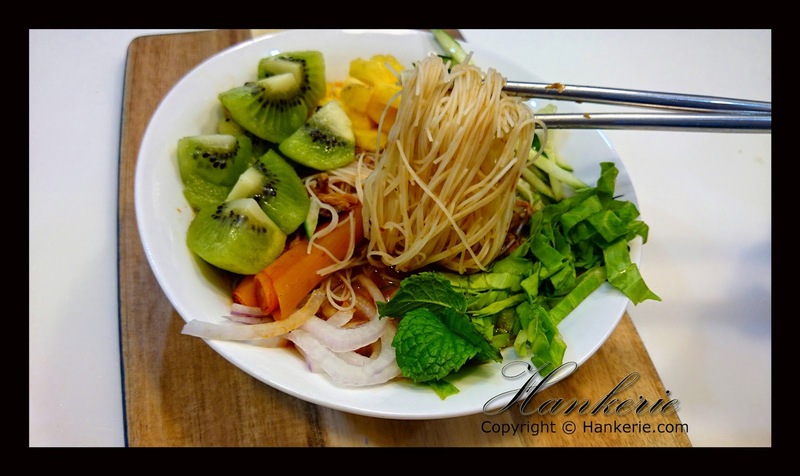 Of course, this could not compete with the traditional Penang Asam Laksa, but we found this new recipe can be accepted easily. Caramelize chopped red onion with some oil in the hot pot, slowly cook until it turn a bit golden brown. Mix in the chilli paste and stir it. Combine Sardin fish, galangal and water, or enough to cover fish, bring to the simmer over medium-high heat. Reduce heat to medium and simmer (5-10 minutes). Add tamarind liquid and asam gelugor to stock, season to taste with sugar and salt, simmer until well flavoured (20-30 minutes), check seasoning and add some more flaked fish (optional). Meanwhile, blanch vermicelli in a large saucepan of boiling water until just tender (2-3 minutes), drain, divide among serving bowls. 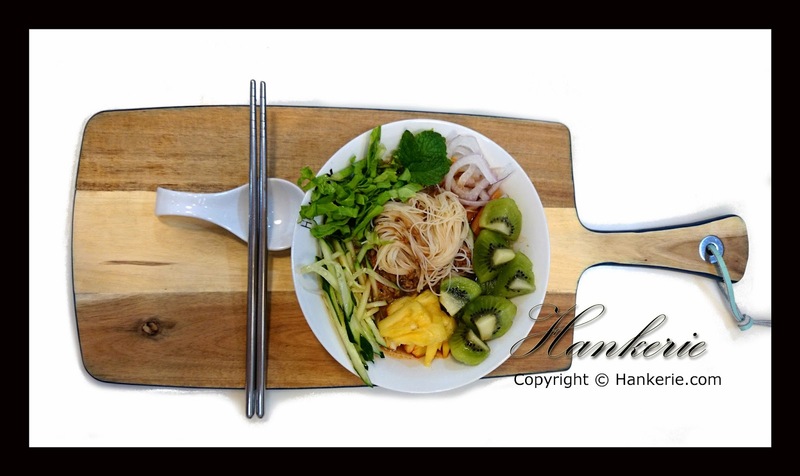 Top with remaining fish, ladle hot stock over, top with green kiwifruits, pineapple, cucumber, onion, lettuce and mint leaves, and serve with extra garnishes on the side.